No matter how careful you are with your carpets and rugs, sometimes you just can’t keep them clean. You do your best to remove and prevent stains, and they look pretty good. But even the cleanest-looking carpets can retain lingering smells. Sometimes what you need is quality carpet sanitizers and deodorizers to disinfect and remove odors from your carpets. Over time, body odor, pet odor, and cooking smells stay behind on your carpets and rugs. Even if your carpets aren’t stained, they can still benefit from the best carpet cleaning company in North Bay. 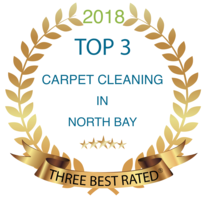 Carpet Cleaning North Bay does more than just clean carpets. If you have strong, lingering smells in your carpets, call us. We’ll leave your home smelling fresh again. If you walk into your home and turn your nose up at old smells, it’s time for quality carpet deodorizing. Whether your home is stuck smelly musty, or has old food or pet smells, we can make it smell like new again. You don’t have to live with old carpets and rubs any longer. We are here to help you. We can start by extracting tough stains and smells with our quality cleaners and steam carpet cleaning equipment. Once we’re done removing them, we can apply our best carpet deodorizers and sanitizers to neutralize strong odor and keep them from coming back. No matter why your carpet is retaining smells, we can get rid of them for good. We offer the very best in local carpet sanitizer and protectors to keep stains and smells gone for longer than anyone else. No other local carpet cleaning service in North Bay can compete with our trained professionals on quality. Many homeowners get frustrated with their lingering carpet odor and throw their old carpet out. They don’t realize the odor have actually penetrated down into the carpet’s padding. Realizing they paid for new carpet for nothing just leaves them frustrated. But with our company, we always clean deep down to the padding to remove long-lasting stains and smells. Combined with our carpet sanitizing and deodorizing services, you’ll have carpets that look and smell great for a long time. Store bought carpet deodorizers only treat the top of the carpet surface. Once you vacuum, they become airborne, leaving the room smelling fresh for a short period of time. But we use deep penetrating deodorizers to make sure we kill tough smells each time. Don’t just cover up long-lasting smells; have us get rid of them once and for all. 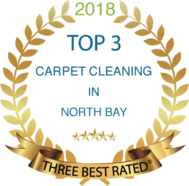 Whether you have carpets, rugs, or furniture that you can’t seem to get the smells out of, Carpet Cleaning North Bay is here to leave your home and carpets smelling fresh the way you want it to. You don’t have to put up with a smelly home anymore. We can remove lingering odor from most surfaces, making your home smell like new again!